As we saw from the last post, cabbage is both very high in antioxidants and in season right now. Thus, I asked Madeleine to share with us today this phenomenal cabbage salad that she brought to our last community dinner. I highly recommend you stock up on some farm fresh cabbage and serve this at your fourth of july feasts! As long as you like cilantro, you won’t be disappointed. Hi, my name is Madeleine and I am a former Riverbank farm intern. I have lived on a couple different organic farms and have learned a lot about eating seasonally. I currently work as a nurse but my husband works on the farm so while I may not get to eat the veg right out of the field, I do get to eat my fair share of delicious fresh vegetables and farm market trade treats (like cheese! and cookies!). This recipe uses many ingredients that are abundant and delicious right now. The recipe is inspired by a chutney recipe from Madhur Jaffrey’s cookbook Flavors of India. It uses Caraflex cabbage. My husband brought his love of this type of cabbage from Germany and we started growing it at Riverbank farm. It makes the cutest little pointed heads, like little gnome hats and is especially sweet and tender (regular white cabbage would work as well). The other seasonal stars are garlic scapes (the flower stalk of the growing garlic plant), cilantro and purplette onions (a small early variety of onion, guess what color they are…). This slaw was a big hit at our Indian themed pot luck last week where we had lots of breads and curries but not much in the way of fresh salads. 1. Combine the cabbage and sliced onions in a bowl and set aside. 2. Put the nuts into an electric blender and chop until finely ground. 3. Add the rest of the ingredients to the blender and pulse until smooth with slight texture. 4. 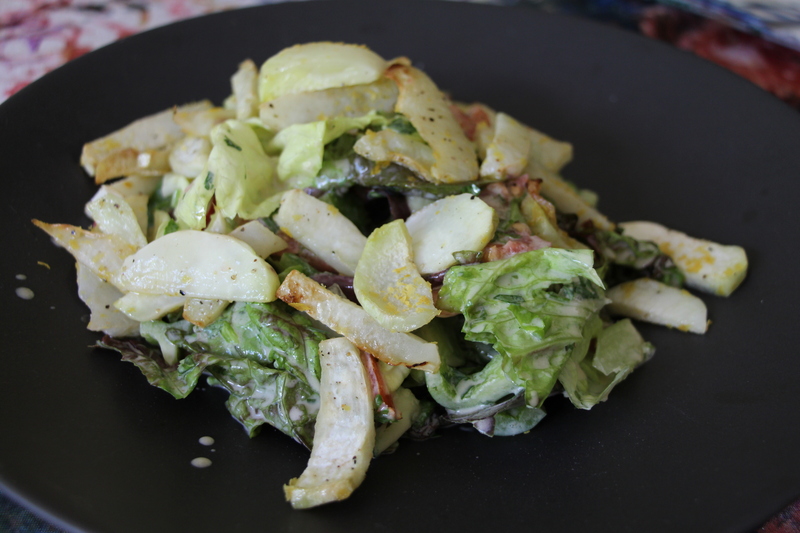 Dress the cabbage and onions with the dressing and let sit for at least 30 minutes to let the flavors combine. 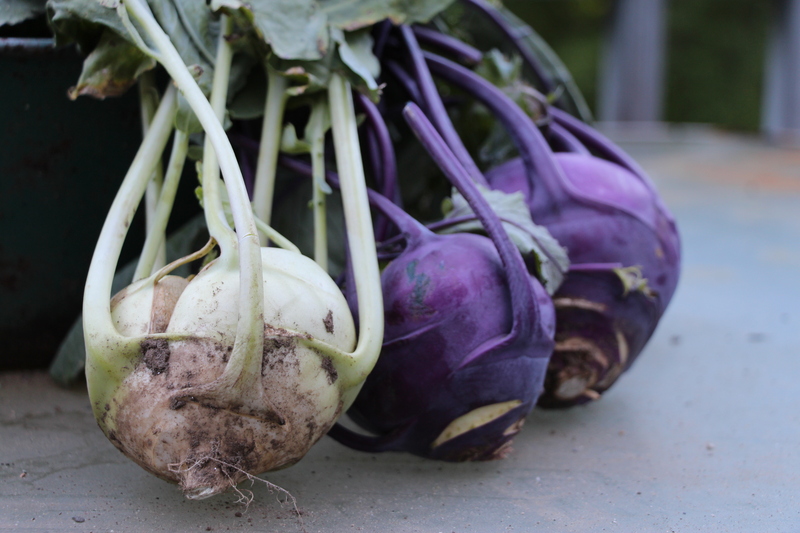 Last week I met a new vegetable named kohlrabi, and let’s just say it was love at first sight. I was completely enthralled by how beautiful it is and since trying them for the first time, I’ve become obsessed. The easiest way to eat these is raw. After peeling them you can munch on them like an apple, chop them and eat with your favorite dip, or shred them in with other vegetables. I found raw they taste like a radish, but with much more flavor. However, not wanting to stop here, I decided to try roasting some. Oh man, they came out tasting like a spicier version of broccoli with an amazing texture! They were the perfect thing to top off the very large salad I made post farmer’s market (because what better way to celebrate a farmers market than making a salad). Preheat the oven to 350 F. Put kohlrabi on an oiled baking sheet (making sure they all get coated in oil) and sprinkle them with salt and pepper. Roast for about 30 minutes or until golden brown, remembering to stir about every 15 minutes. Once the kohlrabi is fully cooked (softer and browning on the edges), sprinkle generously with nutritional yeast and serve. 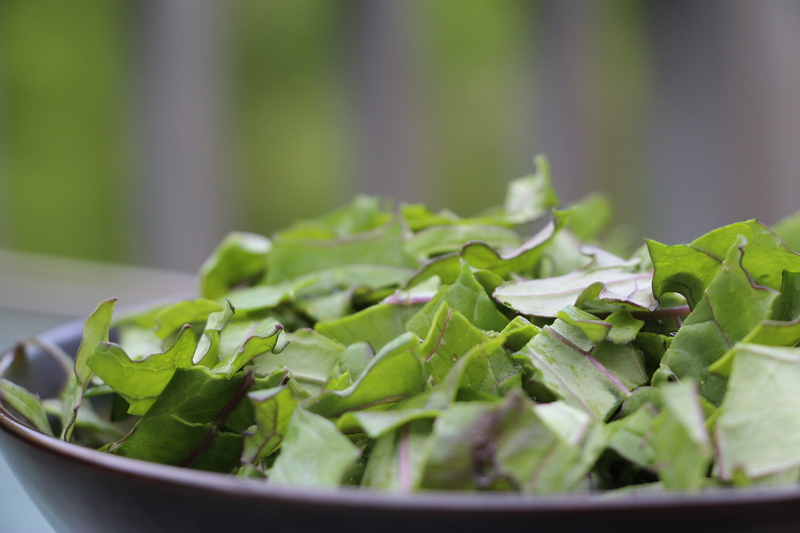 These make a great addition to any salad, but can also be snacked on plain. Hi Everyone! You might have noticed I haven’t posted in a few months — I’ve been busy wrapping up my Peace Corps service and moved back to the U.S. just last week. Luckily, I’ve found a job working at Riverbank Farm – an organic vegetable farm in my hometown. Hopefully in the next couple of months I will be able to post a lot of food made from our wonderful fresh produce. So, to start us off kale, is in season! 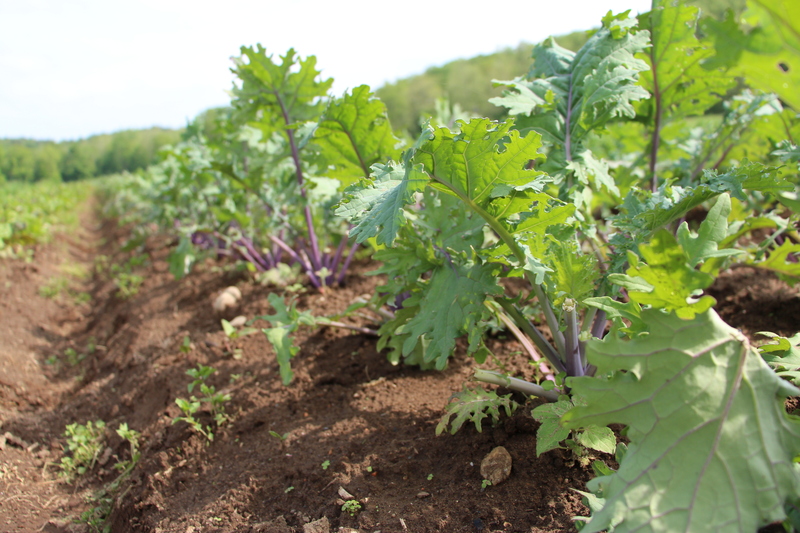 We are growing three types of kale at the farm: Red Russian, Lacinato, and Curly. For this simple kale salad, I like Red Russian the best. It is a very tender and a bit sweeter than the others. 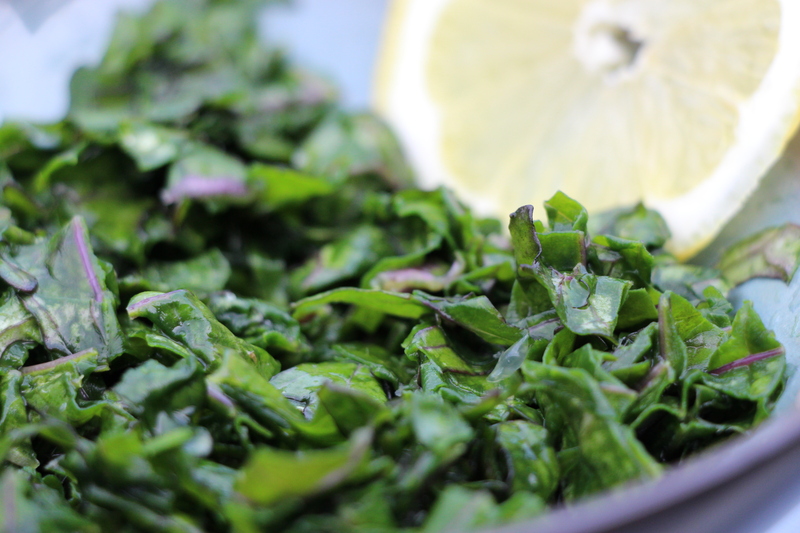 Strip the kale leaves off the meaty part of the stems and coarsely chop. Throw in a bowl with a small amount of sea salt. With clean hands, massage the sea salt into the kale. This seems strange, but massaging the kale with sea salt will break down the kale until it releases its juices and becomes very tender and tasty (see left: kale pre-massage, right: kale post-massage). Note: be careful not to add too much salt too fast. It is easy to feel like the massaging isn’t working as fast as you expect and think you need to add a lot more salt. Maybe you do, but do this slowly otherwise you will end up with some very salty kale salad. Finally, drizzle with a slice of lemon and enjoy! This salad makes a great side to many dishes. I have eaten it with saucy chickpeas and rice, black bean burgers, and even falafel. Below I made a fancy salad where I layered spinach, salad greens, and simple kale salad as the base. Next I added local tomatos, chips, hummus, and topped it off with vinaigrette. 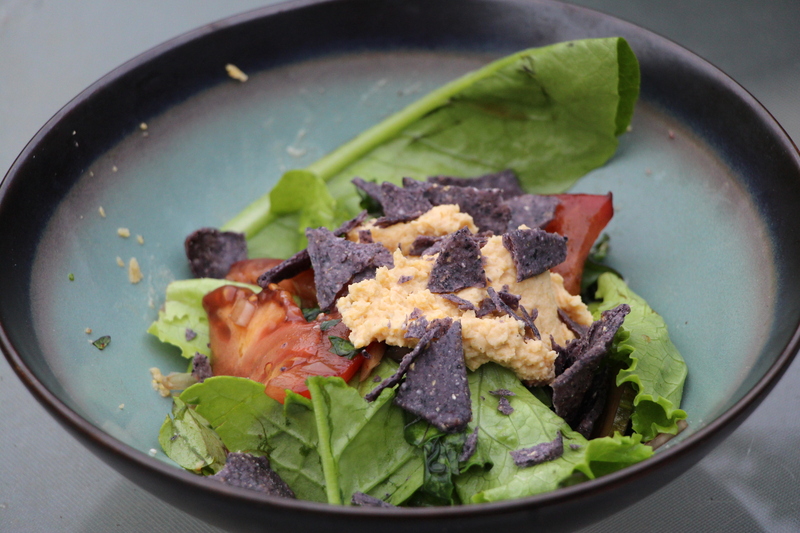 Another winner from Fran’s House of Ayurveda, I love this hot version of a summer salad! Steam the green beans then the potatoes until tender-crisp, so not quite cooked all the way. Then, in a large pan or wok, heat some oil and saute the raw onion slices (not pre-steamed) until soft. Add the garlic, cumin and coriander and stir a bit, then add the steamed veggies and chickpeas. Season with salt and pepper while sauteing for a few minutes. 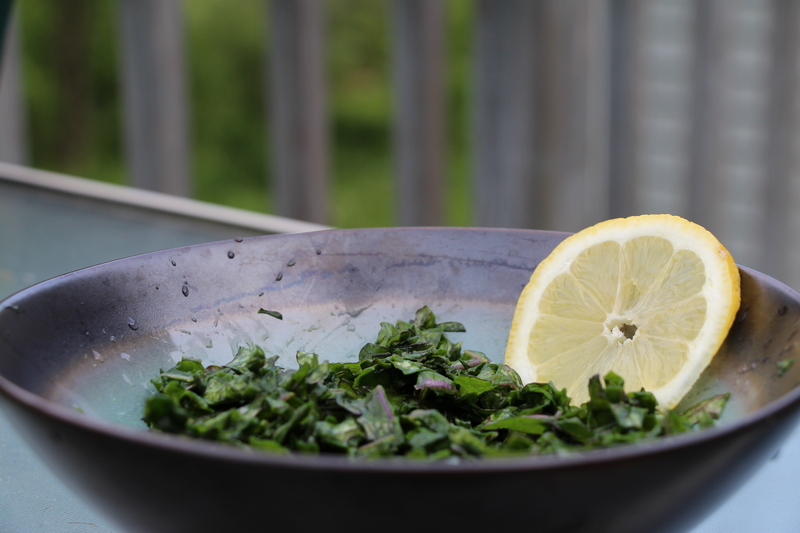 Serve hot sprinkled with cilantro and a big squeeze of lemon juice! Click here for the cold version. This sweet grilled salad makes a great side dish and reminds me of my days in Taiwan. I adapted it from the Microwave Gourmet, a cookbook my grandmother was excited about. 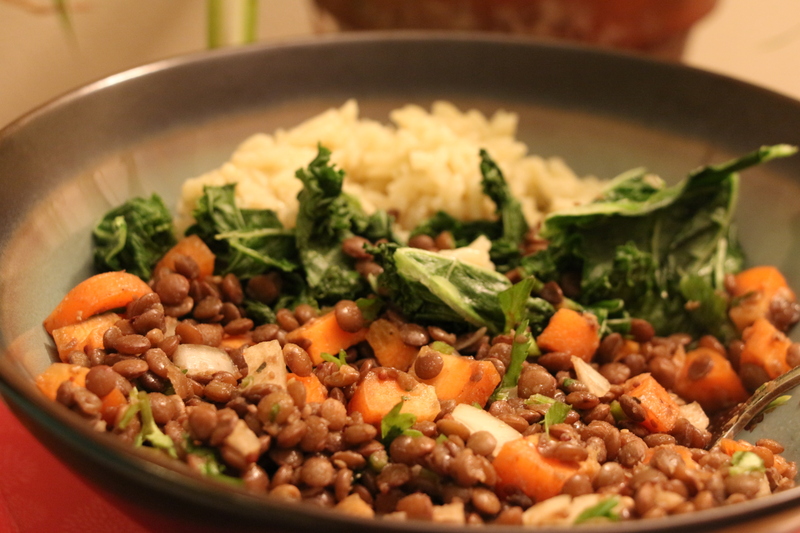 This recipe was inspired by the Broccoli Raab Salad in Veg. Times. It is a surprisingly filling meal. Make squash sticks from kabucha squash. Heat 2 Tbs. oil in wok over medium-high heat. Saute garlic until it sizzles then add broccoli and red pepper flakes. Season with salt, and saute 5-7 minutes or until broccoli seems cooked. Transfer to bowl. Add remaining 1 Tbs. oil to wok. Add tomatoes, and cook for a few minutes. Add white beans and cook until warm.